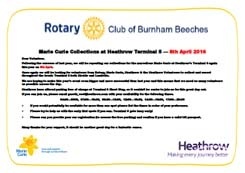 Following the success of last year, the Rotary Club of Burnham Beeches will be repeating the collections for the marvellous Marie Curie at Heathrow's Terminal 5 this year. Volunteers needed, please! Join volunteers from Marie Curie, Heathrow and Heathrow Volunteers throughout the iconic Terminal 5 and enjoy a great day for a fantastic cause! Help make this event even more successful than last year! Don't Panic!!! Easy to manage 3.5 hour time slots! Free parking at Terminal 5 Short Stay! Please download the information sheet below and email Gareth Vest with your availability. Many thanks for your support, it should be another great day for a fantastic cause!